The prominent Non-Governmental organisation- HUMAN RIGHTS WRITERS ASSOCIATION OF NIGERIA (HURIWA) has upbraided the acting Inspector General of Police Mohammed Adamu for dereliction of duty tantamount to criminal negligence which must not go unpunished for permitting armed thugs of political parties to unleash violence during Saturday's March 23rd 2019 governorship re-run poll in parts of Kano state. HURIWA specifically condemned the fraudulent claims of a peaceful re-run election made to the media disgracefully by the Deputy inspector General of Police Mr. Michael Anthony Ogbizi that contrary to widespread and extensively reported evidential proofs showing widespread reign of bloody violence meted out to supporters of the opposition Peoples Democratic party (PDP) by armed thugs recruited by the All Progressives Congress (APC) in many parts of Kano state. "This deputy Inspector General of police represents every negative indices that the notoriously compromised policing institution is frequently rebuked from all across the civilised World for operating in a format that is antithetical to constitutional democracy and respect for the principle of rule of law. He should cover his face in shame if he has a conscience for denying the obvious". HURIWA stated that it has always known that there was no valid, cogent and verifiable reasons for the Independent National Electoral Commission to have selectively declared inconclusive, governoship polls that the opposition Peoples Democratic party were at the verge of emerging victorious even when the same electoral umpire was the first to have always declare the results of elections in places like Kwara and Ekiti states just to spite and intimidate the likes of Senate President Dr. Bukola Saraki and erstwhile Ekiti state governor Ayodele Peter Fayose both of whom are some of the most trenchant critics of President Muhammadu Buhari's style of leadership. HURIWA wondered how the hierarchy of the Nigerian Police force deliberately allowed armed thugs of All Progressives Congress made up mostly of notorious drug addicts to wage internecine war against the members; officials and supporters of the opposition political party- Peoples Democratic party (PDP) to an extent that even journalists were not spared. 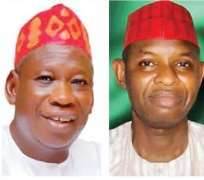 "To now watch the DIG tell some wicked lies denying the correct reports of violence in Kano state during the re-run election is therefore very insulting and is nothing short of an unambiguous evidence that the police officials from the top are criminal collaborators with some criminal elements in Kano to undermine and thwart the democratic will of the good people of Kano state. Both INEC and the Police are hereby condemned for these atrocious criminal plots to destroy democracy in Kano and Nigeria through the cocktails of cooked up figures been bandied as outcomes of the badly managed polls". HURIWA recalled that their members on ground claimed that the Peoples Democratic Party (PDP)’s supporters were forced into hiding as APC took control of everything even as HURIWA learnt from media reporters that when the reporters visited the flashpoints in Kano at around 3:30pm they observed massive exodus of those supporting PDP out of the area and a resident, Ya’u Alhaji, told reporters that the hoodlums that took over the streets were brought in to intimidate residents. HURIWA stated thus: “Aside our members who were on ground who raised alarm, even the foreign amd local media reported some of those voters interviewed as stating that the armed political thugs are not from their area but that they were only here to cause mayhem." "Residents of Gama disclosed that they have seen a lot of strange faces in the area right from the time of early morning prayer and those ‘strangers’ later took over the streets of Gama brandishing weapons and unleashing terror.It is not possible to identify yourself as PDP member here, not to talk of Agent. You can’t hang any PDP tag here,” a Gama resident stated.It was earlier reported that some journalists were harassed as some of them escaped lynching by the hooligans." HURIWA has therefore asked INEC to annul the manipulated and violently obtained results of the Kano re-run election and to proceed to announce the already collated results prior to the so called re-run poll and declare a winner since the places for the re-run election do not constitute a good enough reason for voiding the previously collated and announced results.